You know that saying that variety is the spice of life? Well one attorney is really taking the meaning to the next level. Meet Kya Johnson, an attorney, who became an entrepreneur, that is bringing diversity to children's programming. She launched her online entertainment channel RainbowMe in 2014 to tackle the lack of programs that had children of ethnic minorities who were the lead characters. Racially diverse children from African-American, Latino and Asian backgrounds now make up nearly half the population of 60 million U.S. children under age 12. Yet fewer than 10 percent of entertainment programs directed at children feature protagonists of color, Johnson said. The more Johnson researched the impact of homogenous programming on children, the more she felt that something needed to be done. 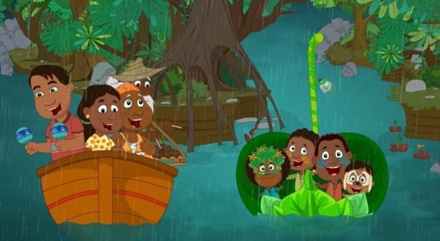 RainbowMe’s site features cartoons, books and games with boys and girls of color as lead characters. Johnson hopes to include content featuring disabled children in the future. You can read the full article here and get to know more about the channel at their website. Posted on July 23, 2015 by Adamu Waziri and filed under Black Kids Cartoon, Education, Mothers. Only 5000 Bino & Fino DVDs for the US and 5000 DVDs for UK & Europe will be made this year. This year we're going to only make 5000 DVDs for the U.S. and countries whose DVD systems are compatible with the U.S. such as Canada. We are also going to do the same for Europe and the U.K. and produce 5000. Posted on July 3, 2015 by Adamu Waziri and filed under African kids cartoon, Black Kids Cartoon and tagged Bino and Fino Goodies. Let's Create A New Black Doll For Kids This Year! Let's create a new black doll for kids this year. Why not? We know we need more of them. Join the mission. Posted on May 21, 2015 by Adamu Waziri and filed under Fun Stuff, Black Kids Cartoon, African kids cartoon and tagged black dolls.